The Office of Emergency Planning within Ireland’s Department of Defence wanted a robust and reliable emergency response SMS management system that would allow it to fulfil its co-ordination function as cost effectively and efficiently as possible. Púca’s Message Manager system enables the Office to communicate instantly with all its stakeholders and increase productivity by reducing the set-up time for emergency planning meetings and other key events. As part of its co-ordination role, the Office of Emergency Planning (OEP) convenes regular meetings of the Government Task Force on Emergency Planning. The OEP decided it needed a fast, reliable and secure emergency response SMS text management system that would allow it to convene meetings at short notice and to ensure that all messages were safely delivered to their recipients. After tendering for the system, the OEP awarded the contract to Púca Mobile Group. 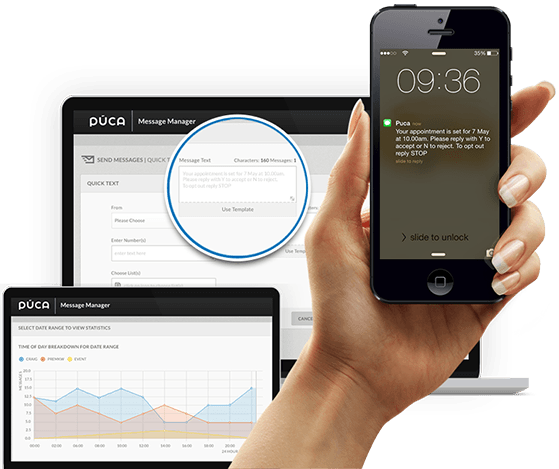 Púca developed a custom version of its Message Manager system, a market-leading self-service application designed to help organisations such as the OEP manage two-way emergency response SMS messaging easily and conveniently. Using the simple and intuitive web-based interface, staff can prepare, send or schedule SMS messages. As a hosted service, there is no need to install software or hardware and any technical issues that arise are dealt with directly by Púca’s technical support team. Full training in the use of the system was provided by Púca. Speed, reliability and ease-of-use are all hallmarks of the new communications system which has made the task of organising GTF meetings much easier and more efficient. Where meetings are called at very short notice attendees can be instantly notified and the delivery confirmation feature means no one can be left off the list in error.